Abdominal rectopexy for patients with rectal prolapse is well suited for laparoscopic approach as no resection or anastomosis is necessary. The objective of this study was to compare efficacy and safety of laparoscopic and open abdominal Wells rectopexy in patients with full-thickness rectal prolapse. Between January 2010 and December 2015, 70 patients underwent abdominal rectopexy for full-thickness rectal prolapse. 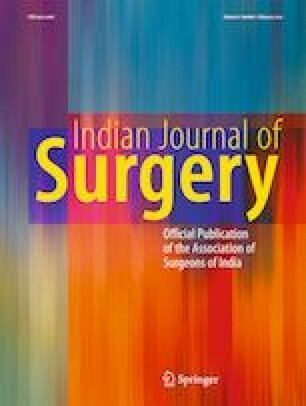 Among those 70 patients, 40 patients underwent open rectopexy and the remaining 30 patients underwent laparoscopic rectopexy based on preference of the patient. Both these groups were compared for operative time, intraoperative blood loss, post-operative pain, duration of post-operative stay, post-operative complications/morbidities, and recurrence. Mean operative time was longer in laparoscopic group compared to open group (204.83 min vs. 159 min; p < 0.001), mean intraoperative blood loss was less in laparoscopic group (43.18 ml vs. 121.13 ml; p < 0.001), post-operative pain was milder in laparoscopic group at 12 h, 24 h, and 48 h. Mean hospital stay post-operatively is shorter in the laparoscopic group (4.53 vs. 8.15 days; p < 0.001), complications/morbidity were lesser in the laparoscopic group (p < 0.05). Recurrence was observed in two patients in open rectopexy group and one patient in the laparoscopic group, p value is .733 which is statistically not significant. This study demonstrated significant differences in favor of laparoscopic rectopexy. To conclude the laparoscopic approach may be considered as a better approach for rectopexy in patients with full-thickness rectal prolapse.